Are you looking for House of Horror by Tiny Boy? Click here! 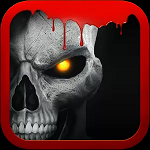 Below is the full walkthrough for the Android game "House of Horrors" by developer dim_ok. Tap the opening of the house with the pillars. Tap the skull to make it drop to the ground. Pick up the keys, then open the door. Look at the right side of the room and notice the number "573" on the table. Go back to the left and pick up the crowbar, then use it on the door on the left with the blood hand prints. Go into the door on the left and look closely at the bathtub. Just tap the key to take it, then leave. Go through the other door. Look at the microwave and tap it until the light is green, then exit through the door on the left. Wait until the man finishes talking and the zombie attacks him. Repeatedly tap the zombie until you hit it with the crowbar, then continue on. Go through the second door on the right. Open the right cabinet and there will be a zombie. Repeatedly tap it until you hit it. Remember the number "462" written inside. Go outside. Go around the corner and into the first door on the left. It will ask you for the password. Enter "462", then press open. (you can just tap anywhere on the screen after typing it in to remove the keypad). Once you're inside, look at the small wooden box. It will have the number "666" written inside. Use the door on the far left to go back out. Tap the 4th door on the far right, and enter the password (573 from the table). Go up the stairs and you will find the wife of the man from earlier. Tap the ball and chain attached to her leg and enter the password "666" to unlock it. When the monster attacks, just tap it repeatedly until you hit it twice and kill it. Go into the door on the left and tap the bread to give it to the woman. Go out and then into the door on the right. A man will tell you about portals. Once he finishes talking, exit the room. Go through the door at the end of the hall. Repeatedly tap on the right side of the screen to go to the next area, then repeatedly tap the door on the right to go in. There will be a portal. Go inside. Proceed to House of Horrors 2!